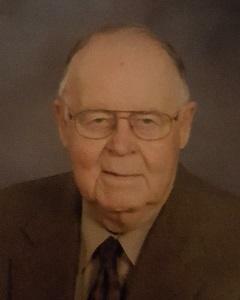 John William Drew, 97, of Glencoe, passed away Tuesday, Oct. 2 at Glencoe Regional Health Services Long Term Care in Glencoe. Memorial services were held Tuesday, Oct. 9, 11 a.m., at First Evangelical Lutheran Church in Glencoe with interment following at church cemetery. Pastor Peter Adelsen was the officiating pastor. Pastor Ronald Mathison, Psalm 23 & John’s obituary; Casey Brinkman, Ecclesiastes 3:1-8; Derek Brinkman, II Timothy 4:6-8; were the readers. Jan Heins was the organist. John’s grandsons, Joe Oelfke and Paul Oelfke, sang John’s favorite hymn, “Old Rugged Cross.” “Rock Of Ages,” “Abide With Me,” “Just As I Am,” and “Beautiful Savior” were the congregational hymns. John William Drew was born July 6, 1921, in McVille, N.D., to Granville and Edith (Taylor) Drew. He was baptized as a young child April 14, 1929, by Rev. Lee Paulson in McVille, N.D., and later confirmed in his faith on May 21, 1943, by Rev. H. C. Streufert at First Evangelical Lutheran Church in Glencoe. Mr. Drew received his education in Glencoe, graduating with the Glencoe High School Class of 1940. In 1929 the Drew family moved to rural Glencoe, where Mr. Drew grew up with his nine siblings on a farm near Sumter. On Oct. 14, 1942, Mr. Drew married his childhood sweetheart, Norma Stradtmann. Rev. Alf. R. Streufert performed the ceremony at First Evangelical Lutheran Church in Glencoe. John and Norma made their home and farmed the same Stradtmann farm in rural Glencoe, from 1942-1999. After that amount of time, the Stradtmann farm became known as the Drew farm. Then in 1999, they moved into Glencoe. John and Norma’s lives were blessed with two daughters, Barbara and Cindy. They shared over 57 years of marriage until Norma passed away on Nov. 25, 1999. Mr. Drew enjoyed farming and especially the relationships with his special neighbors and friends. He loved taking trips, music and whistling. John treasured the time spent with family. Mr. Drew was a member of First Evangelical Lutheran Church in Glencoe and on the board for the Federal Land Bank. In 2013, Mr. Drew moved to Glencoe Regional Health Services Long Term Care in Glencoe, where he passed away on Oct. 2, 2018, at the age of 97 years, 2 months and 26 days. John is survived by his daughters, Barbara Oelfke and her husband, Ken, of Rochester, Cindy Soukup and her husband, Steve, of Prior Lake; four beloved grandsons, Joe Oelfke and his wife, Cris, Paul Oelfke and his wife, Lea, Casey Brinkman and his wife, Maria, Derek Brinkman and his wife, Ann; two step-grandchildren; nine great-grandchildren; five step great-grandchildren; sister, Betty Knick; brother, Granville Drew and his wife, Colleen; sister-in-law, Selma Streufert; nephews, nieces, other relatives, and many friends. Mr. Drew was preceded in death by his parents, Granville and Edith Drew; wife, Norma Drew; siblings and in-laws, Charles Drew and his wife, Clara, Evelyn Drew, Dorothy Klopfleisch and her husband, Fred, Jeanne Heyen and her husband, Francis, Lenore Rolf and her husband, Elmer, Lester Drew and his wife, Sarah, Rueben Knick, Dale Drew and his wife, Rosie; brother-in-law, Mark Streufert. www.mcbridechapel.com and visitors may click on obituaries/guest book.